Back in June, Unilever’s Chief Marketing Officer, Keith Weed, declared that influencer marketing was broken, and he had some ideas on how to fix it. The biggest problem he identified was fraud: in a market where the number of followers determines value, it’s no surprise that there are some ethically challenged influencers buying fakes to raise their price. And with measures of engagement equally or more important than reach, bots that like and comment on posts can drive fees even higher. Weed detailed a three point plan for how the industry as a whole needs to improve, but none of what he says matters nearly as much as his vow to not work with influencers who’ve bought followers. When someone with a $7bn marketing budget draws a line in the sand like that, the influencer marketing industry will listen. Dishonest influencers, poorly vetted platforms, and agencies that work with either are automatically excluded from getting their hands on any piece of that budget. That’s enough of an incentive for the industry to start correcting itself. But how will they do that? If you’re particularly sharp, you can poke around an influencer’s profile for an hour or so, check out some historical data on follower and engagement growth, and look at the accounts behind some of the more questionably-human comments. That’ll give you enough of a basis to make an educated guess on their authenticity, and chances are you’ll be right. Sure, you could do this—spending 60 or so minutes to get enough information to make a guess for which you have a good chance of getting it right—and then do it for every influencer you’re working with, too. OR, you could use some software that tells you everything you need to know, takes a few seconds to do so, and is way more accurate than you could ever hope to be. If option two sounds better, then HypeAuditor is the software to do it for you. Unlike most influencer marketing platforms, there’s no discovery or campaign management to find here. HypeAuditor is actually the result of a pivot away from that model. The company founded an IM marketplace in 2016 and struggled to gain any real traction in the marketplace. As CEO Aleksandr Frolov ever so humbly explained, “We looked at what we were doing versus what everyone else was doing. And we found that we were not so good.” The team re-grouped to identify what was working, and started to understand that they excelled at the tech side of things—especially around data and analytics. While they continued to improve the product, HypeAuditor became the natural evolution of this realization. 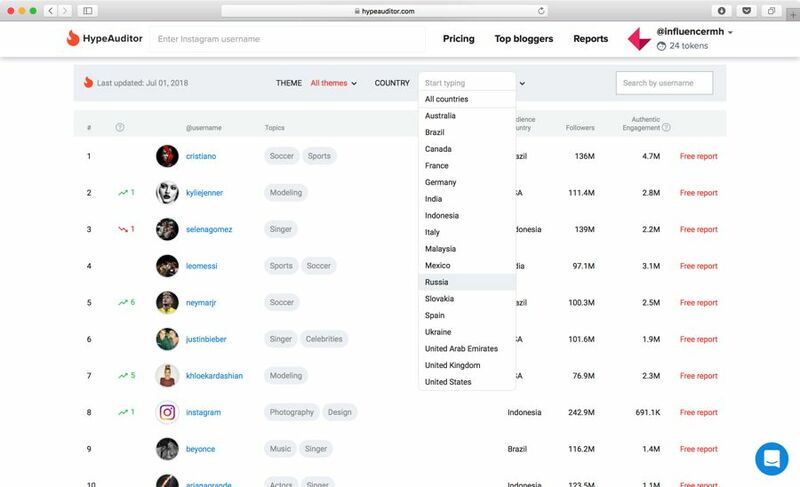 By 2017, HypeAuditor became its own entity—a vast database powered by artificial intelligence that’s indexed nearly 3 million Instagram profiles so far, and continues to grow every day. Fraud ID is enough of an attraction, but the analytics go deeper than that, giving brands and agencies very detailed insights into influencers and their audiences. HypeAuditor was purpose built for fraud detection, but that seems like an understatement. 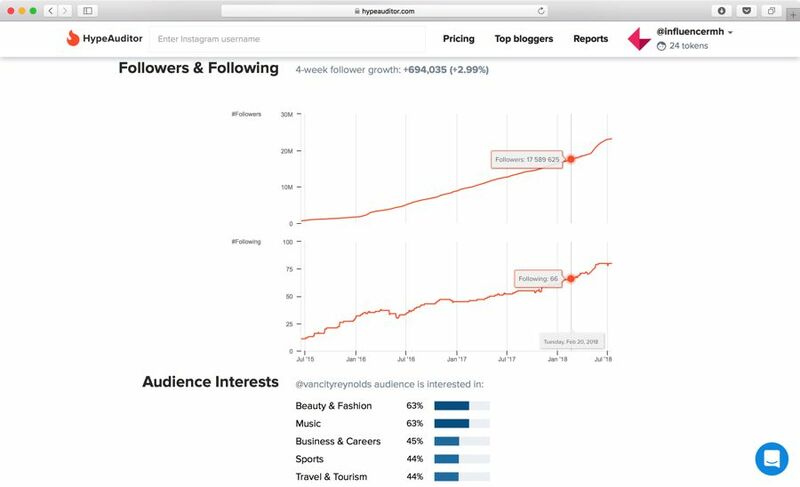 The platform analyzes influencer profiles, digs deep into each audience, and is generally on the lookout for the kinds of data—like suspicious spikes in follower growth, or bot-generated comments—that can expose fraud. But the developers took things a step further by flipping the premise of fraud detection on its head: the point of identifying fake or ghost followers is not to punish them, but to understand the the actual quality of the audience as a whole. So, really, that’s what HypeAuditor is focused on: audience quality. By doing it this way, the platform provides a much more valuable service than if it were just a simple way of spotting fraud. There are 28 different metrics and scores, giving users a thorough understanding of who they’re dealing with. It all starts with the Audience Quality Score (AQS). Scored on a scale of 1 to 100, the AQS gives a quick way to judge an influencer’s actual value. Anything over 70, they tell you, is someone that you can feel comfortable with: this is an influencer whose audience is made of predominantly real people who are authentically engaged. Between 40 and 70 will merit further investigation. 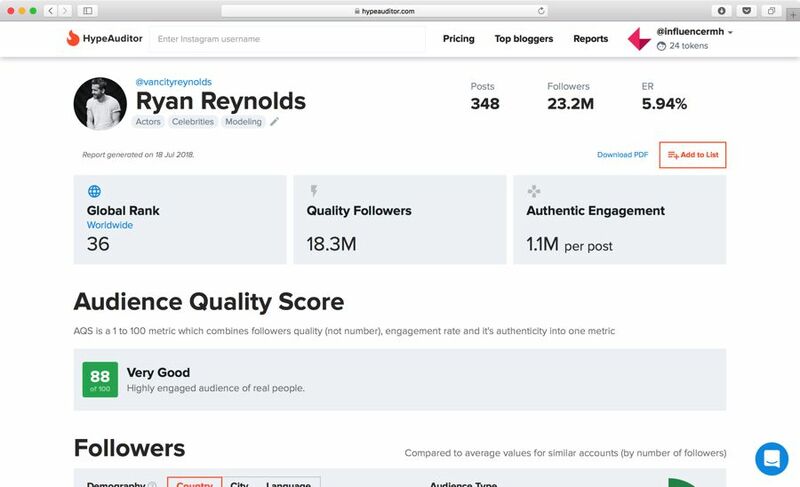 The score applies to the overall audience, but when you dig deeper using HypeAuditor, you may find—even if there’s a high number of fake followers—that the authentic ones are still passionate and engaged and worth reaching. In this case, the AQS gives brands empirical data with which they can use to negotiate more realistic fees. Why pay to reach a million followers when only 600,000 of them are real people (and only half of those are actually paying attention)? This is where the 27 other data points come into play. You’ll look at their followers to get some basic audience demographics, like their geography and gender. But you’ll also get an assessment of how many of them are “quality” followers—giving you a more accurate forecast of what that influencer’s reach is. One of the more unique data points is “Follower Reachability.” This is the number of followers in this audience that follow less than 1500 other accounts—the more accounts they follow, the less likely they’ll ever scroll past your content in their Instagram feed. Further, you’ll see their engagement rate, but then you’ll also get a quality score on that, too. Likes and comments aren’t always from real people, and you’ll see the breakdown of the engagement. You might have noticed in that screenshot another of the nice little touches you can find on HypeAuditor, and that’s the context given to each score/assessment. 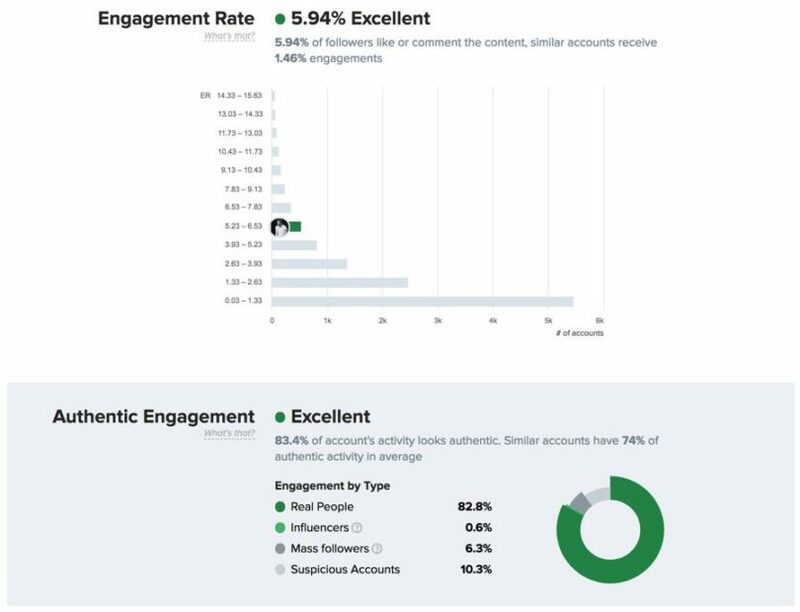 Above, you can see that the engagement rate is 5.94%, while you’re also told that similar accounts average far below that. Below that, you can see that the Authentic Engagement is rated as “Excellent,” and then you’re shown real numbers detailing how much of it came from real people, from bots, etc—and then you’re given the comparison to other, similar accounts. With nearly 3 million accounts indexed already, that’s a big enough sample size to feel confident in HypeAuditor’s accuracy. And that’s only going to get more accurate over time: you can search any Instagram account you want and if it’s not already in the database, then you just added it by searching for it. It’ll take a bit longer—maybe up to an hour at the worst—to get the report because it’s a lot of information to index, parse, and analyse. But so long as the account has more than 1,000 followers, the AI will pull down the info and then learn from it. 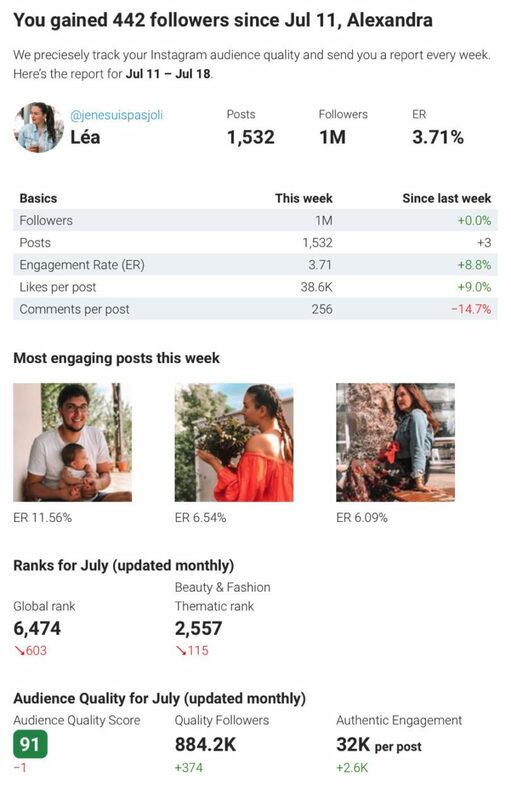 This feature is also helpful for users to monitor their own Instagram accounts, a great way to monitor the overall health of your social presence. Just add your own handle in the “My Report” section, and you’re given the same information you can see for anyone else. You’ll also receive weekly email updates giving a summary of your activity. HypeAuditor’s only real downside is that it’s pretty limited when working with groups as a whole. All the reports you get for each influencer can be found in the “Reports” tab, and from there you can organise these into lists. But there’s really not much you can do with them. 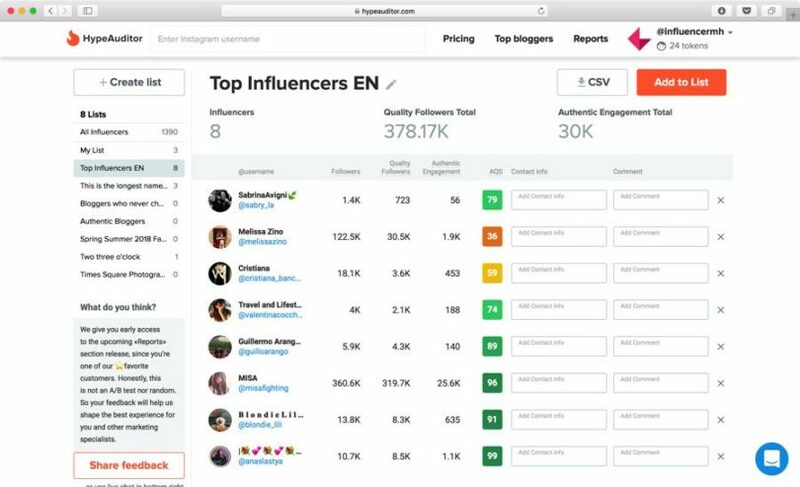 You’ll be given the sum of their quality followers and authentic engagements at the top of the list, and then you’ll see each influencer listed with some basic stats. That’s a good starting point, but it’s in need of a better ending. Being able to get a full report that aggregates all their audiences would be incredibly useful. HypeAuditor doesn’t have too many direct competitors out there at the moment. Many platforms will provide some of the same data used to identify fraud, but it’s still incumbent on the user to do the research and make the determination. Those that are automating fraud prevention aren’t doing it to the same level. 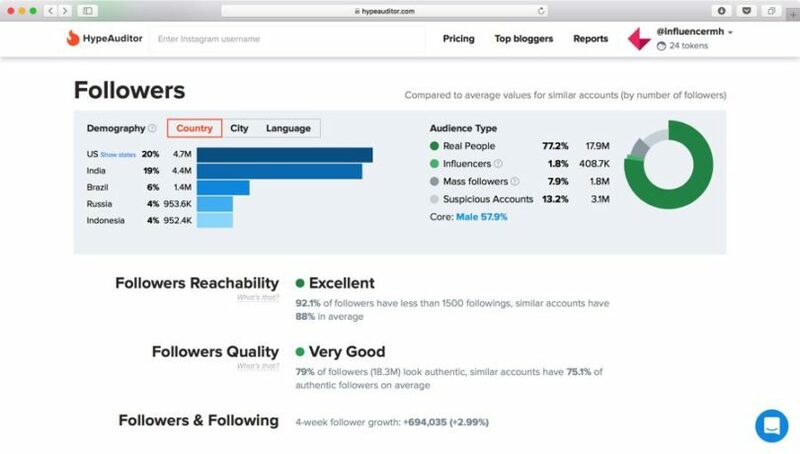 Because HypeAuditor comes at the question from a different perspective—mainly, how good is an influencer’s audience, instead of how bad—they’re coming up with more answers than anyone. You only need a few bits of info to determine an audience is fake; you need much more than this to demonstrate their quality. It would be great to see the developers add some more data and functionality to the lists feature. It’s currently pretty new, anyway, so it’s safe to expect that these will get more robust. But I wouldn’t expect to see them offer much more than that and run the risk of bloat. I like that HypeAuditor is built for one thing—determining audience quality. That it was built and offered as a separate product and the company has another IM related product called Aurora—is promising. You don’t necessarily have to get bigger to get better, and the HypeAuditor folks obviously understand that.